The meticulous Olive Oil Process from harvest to ORENO HELLENIC LADI extra virgin olive oil (EVOO) begins with the picking of the olive fruit. As the years have gone by, so have the days when mules were used to turn the stone wheels to crush the olives. With the progression of time and technology, the natives of the area have been successful in marrying tradition with state of the art facilities and equipment. The olives of the hills of the Aetolia Region are harvested in late December into mid January when the fruit on the trees are 1/3 green, 1/3 yellow and 1/3 purple. The experienced natives after observing the tree cycle for hundreds of years have identified the right moment when the fruit is at peak ripeness for picking to achieve a balance of excellent quality and taste. 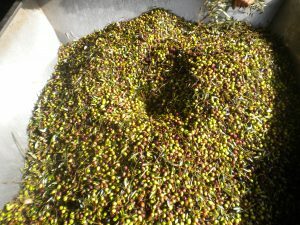 The time the olives are picked occurs during unstable weather or extended cold rains. Finding labor can be difficult and many times, it is friends and family that come together to complete the work in the limited time frame available. The olives are carefully picked by hand with a net fitted tightly around the trunk of the tree and the help of plastic rakes in order to not bruise the fruit. The olives used for the olive oil do not touch the ground. Any olives that do fall on the ground are left and used as fertilizer for the next crop. The olives are bagged in cloth, not plastic so the fruit can breathe while waiting to go to mill within 24 hours. 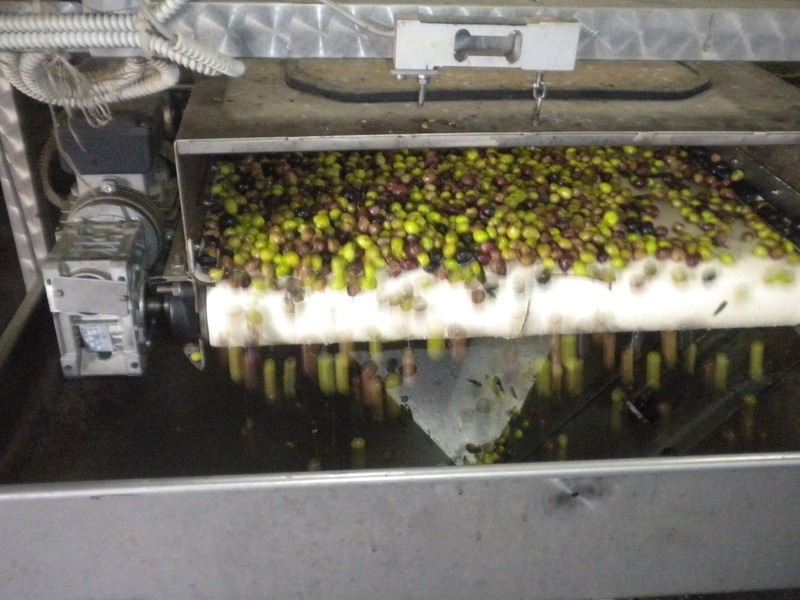 At the mill, the olives are placed in a bin where the leaves and sticks are mechanically removed and then the fruit is washed. Next, the olives are grinded or hammered, including their pits into a paste. The paste is carefully and slowly mixed to allow small olive droplets to combine into larger ones to insure uniformity of the oil. After the mixing comes the pressing. The paste is pressed with water that has been added to facilitate the centrifugal process of separation. The high centrifugal force separated the heavier water from the oil. The separated oil and water are rerun through a vertical centrifuge to separate any remaining water. Finally, the oil pours out of the tube that drains into a steel container until bottled. The first oil to come out of the tube is the tasteful extra virgin olive oil. 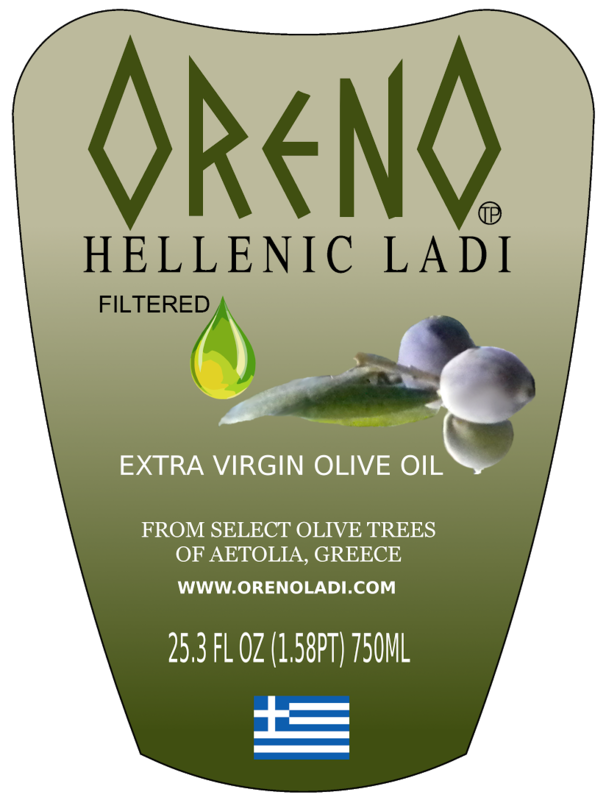 The bottles chosen for ORENO HELLENIC LADI (EVOO) is a dark colored bottle keeping light away from the oil to extend freshness. The amphora shape of the bottle was chosen to emphasize the timelessness of olive oil that has existed since Biblical times. The labels are placed on the bottle by hand due to the curvature of the bottle unlike straight bottles that are machine labeled. These are the three steps to produce and bring to your table a true, traditional, honest and authentic EVOO.